A controversial idea—that amyloid-beta (Aβ) protein fights bacterial infections in the brain—has gained additional support from a new study. Previously, the idea seemed worthy of investigation, if a bit of a stretch, on the basis of cell culture results. Now, thanks to the efforts of a scientific team lead by researchers based at Massachusetts General Hospital, it has been reinforced by observations of how the Aβ protein functions in animals’ brains. Details of the new study appeared May 25 in the journal Science Translational Medicine, in an article entitled, “Amyloid-β Peptide Protects against Microbial Infection in Mouse and Worm Models of Alzheimer’s Disease.” The article suggests that the tendency of Aβ protein to form insoluble aggregates is not, as has been widely assumed, intrinsically abnormal, even though the aggregates are recognized as a hallmark of Alzheimer’s disease. Rather, Aβ protein appears to be a natural antibiotic that can trap and imprison bacterial pathogens that manage to pass the blood–brain barrier, which becomes increasingly “leaky” with age. The MassGen scientists and their colleagues found that transgenic mice expressing human Aβ survived significantly longer after the induction of Salmonella infection in their brains than did mice with no genetic alteration. Mice lacking the amyloid precursor protein died even more rapidly. Transgenic Aβ expression also appeared to protect C. elegans roundworms from either Candida orSalmonella infection. Similarly, human Aβ expression protected cultured neuronal cells from Candida. In fact, human Aβ expressed by living cells appears to be 1000 times more potent against infection than does the synthetic Aβ used in previous studies. That superiority appears to relate to properties of Aβ that have been considered part of Alzheimer’s disease pathology—the propensity of small molecules to form oligomers and then aggregate into Aβ plaques. This propensity, suggests the MassGen-led team, may indicate that Aβ acts like an antimicrobial peptide (AMP). While AMPs fight infection through several mechanisms, a fundamental process involves forming oligomers that bind to microbial surfaces and then clump together into aggregates that both prevent the pathogens from attaching to host cells and allow the AMPs to kill microbes by disrupting their cellular membranes. The synthetic Aβ preparations used in earlier studies did not include oligomers. In the current study, however, oligomeric human Aβ not only showed an even stronger antimicrobial activity, its aggregation into the sorts of fibrils that form Aβ plaques was also seen to entrap microbes in both mouse and roundworm models. The study’s other co-corresponding author, Robert Moir, M.D., also of the MGH-MIND Genetics and Aging unit, noted that the study’s findings may lead to potential new therapeutic strategies. He also indicated that therapies designed to eliminate amyloid plaques from patient’s brains may have their limitations. Deepak Kumar, Vijaya Kumar, Se Hoon Choi, Kevin J. Washicosky, et al. A protein called Aβ is thought to cause neuronal death in Alzheimer’s disease (AD). Aβ forms insoluble aggregates in the brains of patients with AD, which are a hallmark of the disease. Aβ and its propensity for aggregation are widely viewed as intrinsically abnormal. However, in new work, Kumar et al. show that Aβ is a natural antibiotic that protects the brain from infection. Most surprisingly, Aβ aggregates trap and imprison bacterial pathogens. It remains unclear whether Aβ is fighting a real or falsely perceived infection in AD. However, in any case, these findings identify inflammatory pathways as potential new drug targets for treating AD. The amyloid-β peptide (Aβ) is a key protein in Alzheimer’s disease (AD) pathology. We previously reported in vitro evidence suggesting that Aβ is an antimicrobial peptide. We present in vivo data showing that Aβ expression protects against fungal and bacterial infections in mouse, nematode, and cell culture models of AD. We show that Aβ oligomerization, a behavior traditionally viewed as intrinsically pathological, may be necessary for the antimicrobial activities of the peptide. Collectively, our data are consistent with a model in which soluble Aβ oligomers first bind to microbial cell wall carbohydrates via a heparin-binding domain. Developing protofibrils inhibited pathogen adhesion to host cells. Propagating β-amyloid fibrils mediate agglutination and eventual entrapment of unatttached microbes. Consistent with our model, Salmonella Typhimurium bacterial infection of the brains of transgenic 5XFAD mice resulted in rapid seeding and accelerated β-amyloid deposition, which closely colocalized with the invading bacteria. Our findings raise the intriguing possibility that β-amyloid may play a protective role in innate immunity and infectious or sterile inflammatory stimuli may drive amyloidosis. These data suggest a dual protective/damaging role for Aβ, as has been described for other antimicrobial peptides. Confocal microscopic image of the hippocampus showing immunoreactivities for mEGFP (magenta) and the HA tag (green) fused to ß-Actin. Over the past few years, the development of CRISPR technology has helped scientists overcome countless genetic engineering challenges, and allowed them to edit genes with unmatched precision and speed, massively increasing clarity and cutting the cost of research requiring genetic engineering. The technique has been used in myriad ways to increase understanding and treatment of diseases and disorders, but some cells are more difficult to edit than others. Brain cells have proven especially difficult to manipulate using CRISPR. Recently, MPFI researchers Takayasu Mikuni, Ph.D., M.D., and Jun Nishiyama, Ph.D., M.D., and Dr. Yasuda were able to harness the power of the CRISPR/Cas9 system in order to create a quick, scalable, and high-resolution technique to edit neuronal DNA, which they called “SLENDR,” (single-cell labeling of endogenous proteins by CRISPR/Cas9-mediated homology-directed repair.) Using the technique, the researchers labeled several distinct proteins with fluorescence, and were able to observe protein localization in the brain that was previously invisible. That’s just the start of what researchers may be able to accomplish using this reliable, new technique for inserting genes into neurons. CRISPR is a tool built into bacterial DNA that the organisms use to fight infections. When a virus invades and attempts to insert its infectious DNA into that of a bacterial cell, a special section of the bacterial DNA, called CRISPR, cuts the viral DNA and renders it unable to wreak havoc on the bacteria. The organism then inserts a copy of the viral DNA into its own DNA to work as a type of adaptive immune system, to better recognize and defeat the invader in the future. As scientists have begun to understand how this system works, they have manipulated it to target and damage specific, functional genes in a variety of organisms, and in some cases, insert a new gene in its place. Once the section of DNA is damaged, the technique relies on the cell to naturally repair its own DNA. There are two methods that the cell might use to accomplish this. One is homology-directed repair (HDR), the other is non-homologous end joining (NHEJ). HDR rebuilds or replaces the damaged locus of the genome, whereas NHEJ reattaches the damaged ends. When the reattachment occurs following the degradation of the ends, it often leads to the deletion of function of the gene (“knock-out” the gene). If a cell uses HDR to repair itself, scientists can include a desired gene in the CRISPR system that will be inserted into the DNA to replace the damaged gene. Despite the impressive power of CRISPR system, its use in brain cells has been limited because by the time the brain has developed, its cells are no longer dividing. Most mature brain cells will repair themselves using NHEJ. The researcher can’t give the cell a gene to insert if it’s not going to insert one to begin with. While scientists can use CRISPR relatively easily to damage and knock out certain genes through NHEJ in the brain, the lack of cell division has made it very difficult for them to knock indesired sequences to genes, through HDR, with reliable precision. That’s where the SLENDR technique comes in. In the recent study, the researchers at MPFI inserted a gene that made proteins of interest fluoresce under the microscope. They were even able to reliably label two different proteins with distinct colors at the same time in the same cell. The researchers were able to use the technique to visualize the proteins both in vivo and in vitro. And they were able to do it in a matter of days rather than years. With existing knowledge of how brains develop, researchers can adjust the timing and position of the electroporation in utero to accurately target cells that will go on to populate particular cortical layers of the brain, even if they haven’t differentiated and moved to that layer yet. The recent study used the technique primarily to tag certain proteins within brain cells and observe their behavior. But, with continued optimization, the method has the potential to elucidate immeasurable brain activities in both normal and diseased brains, and lead to a deeper understanding of brain function. “The most important part is that precise genome editing is possible in the brain. That’s what’s important,” said Dr. Nishiyama, post-doctoral researcher who worked on the study. “That’s the biggest thing.” Neuroscientists would be remiss to ignore its worth and not explore its potential. Emma Yasinski is a scientific writer at Max Planck Florida Institute for Neuroscience. Correspondence should be directed to Ryohei Yasuda, Ph.D. (ryohei.yasuda@mpfi.org), scientific director, Max Planck Florida Institute for Neuroscience. Findings suggest new ways to treat the malignancy, slow its progression and reveal its extent more precisely. The altered metabolism of two essential amino acids helps drive the development of the most common and lethal form of brain cancer, according to a new study led by researchers at The Ohio State University Comprehensive Cancer Center – Arthur G. James Cancer Hospital and Richard J. Solove Research Institute (OSUCCC – James). The study shows that in glioblastoma (GBM), the essential amino acids methionine and tryptophan are abnormally metabolized due to the loss of key enzymes in GBM cells. The altered methionine metabolism leads to activation of oncogenes, while the changes in tryptophan metabolism shield GBM cells from detection by immune cells. Together, the changes promote tumor progress and cancer-cell survival. “Our findings suggest that restricting dietary intake of methionine and tryptophan might help slow tumor progression and improve treatment outcomes,” says first author and OSUCCC – James researcher Kamalakannan Palanichamy, PhD, research assistant professor in Radiation Oncology. “While we need to better understand how these abnormally regulated metabolites activate oncogenic proteins, our intriguing discovery suggests novel therapeutic targets for this disease,” says principal investigator and study leader Arnab Chakravarti, MD, chair and professor of Radiation Oncology and co-director of the Brain Tumor Program. “For example, restoring the lost enzymes in the two metabolic pathways might slow tumor progression and reduce aggressiveness by inactivating oncogenic kinases and activating immune responses,” says Chakravarti, who holds the Max Morehouse Chair in Cancer Research. More than 11,880 new cases of GBM were estimated to occur in 2015, with overall survival averaging 12 to 15 months, so there is an urgent need for more effective therapies. Amino acids are the building blocks of proteins. Tryptophan and methionine are essential amino acids – the diet must provide them because cells cannot make them. Normally, the lack of an essential amino acid in the diet can lead to serious diseases and even death. Foods rich in tryptophan and methionine include cheese, lamb, beef, pork, chicken, turkey, fish, eggs, nuts and soybeans. Palanichamy, Chakravarti and their colleagues conducted this study using 13 primary GBM cell lines derived from patient tumors, four commercially available GBM cell lines and normal human astrocyte cells. Metabolite analyses were done using liquid chromatography coupled with mass spectrometry. An investigation carried out at The Ohio State University Comprehensive Cancer Center (OH, USA) has uncovered abnormal metabolism of the essential amino acids methionine and tryptophan in glioblastoma. The study suggests that this abnormal amino acid metabolism aids in the development of the disease. Furthermore, the findings, published recently in Clinical Cancer Research, hint at novel methods to potentially treat the malignancy, slow its progression and reveal its extent more precisely. According to the study, it is the loss of key enzymes within glioblastoma cells that results in this abnormal metabolism. Modified methionine metabolism is described as promoting the activation of oncogenes, and the changes in tryptophan aid in masking the malignant cells from the immune system. “While we need to better understand how these abnormally regulated metabolites activate oncogenic proteins, our intriguing discovery suggests novel therapeutic targets for this disease,” commented principal investigator and study leader Arnab Chakravarti (The Ohio State University Comprehensive Cancer Center). Time-resolved studies define the nature of toxic IAPP intermediates, providing insight for anti-amyloidosis therapeutics. Abedini A, Plesner A, Cao P, Ridgway Z, et al. Cryo-EM methods can determine structures of small proteins bound to potential drug candidates. Scientists using a technology called cryo-EM (cryo-electron microscopy) have broken through a technological barrier in visualizing proteins with an approach that may have an impact on drug discovery and development. They were able to capture images of glutamate dehydrogenase, an enzyme found in cells, at a resolution of 1.8 angstroms, a level of detail at which the structure of the central parts of the enzyme could be visualized in atomic detail. The scientists from the National Cancer Institute (NCI), part of the National Institutes of Health, and their colleagues also reported achieving another major milestone, by showing that the shapes of cancer target proteins too small to be considered within the reach of current cryo-EM capabilities can now be determined at high resolution. The research team was led by NCI’s Sriram Subramaniam, Ph.D., with contributions from scientists at the National Center for Advancing Translational Sciences (NCATS), also part of NIH. The findings appeared online May 26, 2016, in Cell. “These advances demonstrate a real-life scenario in which drug developers now could potentially use cryo-EM to tweak drugs by actually observing the effects of varying drug structure — much like an explorer mapping the shoreline to find the best place to dock a boat — and alter its activity for a therapeutic effect,” said Doug Lowy, M.D., acting director, NCI. Both discoveries have the potential to have an impact on drug discovery and development. Cryo-EM imaging enables analysis of structures of target proteins bound to drug candidates without first needing a step to coax the proteins to form ordered arrays. These arrays were needed for the traditional method of structure determination using X-ray crystallography, a powerful technique that has served researchers well for more than a half century. However, not all proteins can be crystallized easily, and those that do crystallize may not display the same shape that is present in their natural environment, either since the protein shape can be modified by crystallization additives or by the contacts that form between neighboring proteins within the crystal lattice. Two of the small proteins the researchers imaged in this new study, isocitrate dehydrogenase (IDH1) and lactate dehydrogenase (LDH), are active targets for cancer drug development. Mutations in the genes that code for these proteins are common in several types of cancer. Thus, imaging the surfaces of these proteins in detail can help scientists identify molecules that will bind to them and aid in turning the protein activity off. In publications in the journal Science last year and this year, Subramaniam and his team reported resolutions of 2.2 angstroms and 2.3 angstroms in cryo-EM with larger proteins, including a complex of a cancer target protein with a small molecule inhibitor. Of note, the journal Nature Methods deemed cryo-EM as the “Method of the Year” in January 2016. “Our earlier work showed what was technically possible,” Subramaniam said. “This latest advance is a delivery of that promise for small cancer target proteins.” For more information on cryo-EM, go to http://electron.nci.nih.gov. Serotonin 5-HT3 is part of the cys-loop receptor family, the mechanism of this family is not well understood due to difficulties in obtaining high resolution crystal structures. Serotonin 5-HT3 receptor is an important druggable target in alleviating nausea and vomiting induced by chemotherapy or anesthesia, as well as psychiatric disorders. It’s structure is critical in discovering new drugs to modulate its activity. Previously, electron microscopy imaging of non-mammalian homologs of Cys-loop receptors provided basic understanding of extracellular ligand binding sites and pore forming domains. Little was known about intracellular domains and the way they interact with cellular scaffolding proteins, as they are absent in non-mammalian homologs. A recent publication in Nature extends our understanding behind the mechanism of serotonin 5-HT3 receptors, by resolving a 3.5A crystal structure. Mouse 5-HT3 exists as a homopentamer and is difficult to express, purify and crystallize. To overcome this challenge, researchers split the receptor by proteolyzing each subunit into two fragments. In addition, an sdAb chaperone, which acts as an inhibitor locking the channel into a non-conducting conformation, was used to stabilized the pentameric structure, enabling resolution of a 3.5A crystal structure. Most importantly the split receptor displays an intracellular domain that is tightly coupled to the membrane domain, which provides important structural information that will lead to further understanding of the physiological conformation of 5-HT3 and Cys-loop receptors. Using a miniature microscope that opens a window into the brain, UCLA neuroscientists have identified in mice how the brain links different memories over time–and this may help develop new drugs in the future for memory-robbing diseases such as Alzheimer’s. Pediatric neuroblastoma is a rare and difficult to treat cancer that forms from immature nerve cells. This form of cancer occurs in 1 in 100,000 children, with 650 new cases each year in the United States. Current therapies, which are non-specific, only provide 40-50% long term survival rate to patients suffering from high-risk neuroblastoma, making this form of cancer an area of high medical unmet need. A new drug, called dinutuxumab was granted priority review and orphan drug designation by the FDA. It is the first drug of its kind to be approved that specifically treats pediatric neuroblastoma. In addition to the approval, the FDA also issued a rare pediatric review priority voucher to the makers of the drug, for future groundbreaking therapies in pediatric neuroblastoma. Dinutuxumab (formerly called ch14.18) is a disialoganglioside (GD2) binding chimeric monoclonal antibody that works in combination with granulocyte-macrophage colony-stimulating factor (GM-CSF), interleukin-2 (IL-2), and 13-cis-retinoic acid (RA) for treating high-risk pediatric neuroblastoma. Antibody therapeutics are highly efficacious and specific towards rare and difficult-to-treat cancers and discovery of new antibody therapeutics will help address critical needs. Antibody drug discovery may be challenging, but working with an experienced partner can help. Cancer, Alzheimer’s disease and other age-related diseases develop over the course of aging, and certain proteins are shown to play critical roles this process. Those proteins are subject to destabilization as a result of oxidation, which further leads to features of aging cells. It is estimated that almost 50% of proteins are damaged due to oxidation for people at their 80s. The oxidative damage mediated by free radicals occurs when converting food to energy in the presence of oxygen. Cellular structures, such as proteins, DNA, and lipids, are prone to these oxidation damages, which further contribute to the development of age-related diseases. Using computational models with physics principles incorporated, de Graff el al. from Stony Brook University unfolded the molecular mechanism that how natural chemical process affects the aging of proteins. First, the authors revealed the major factor to explain stability loss in aging cells and organisms is likely to be random modification of the protein sidechains. Furthermore, through the evaluation and analysis on the protein electrostatics, the authors suggested that highly charged proteins are in particular subject to the oxidation induced destabilization. Even one single oxidation could lead to unfold the whole structure for these highly charged proteins. Old cells are enriched in those highly charged proteins, thus the destabilization effects are elevated in the aging cells. In addition, 20 proteins associated with aging are further identified to be at high risk of oxidation. The list includes telomerase proteins and histones, both of which play critical roles in the aging of cells and cancer development. The team is currently working on analyzing more proteins, with the hope to provide key information to aid targeted treatments against age-related diseases. A major challenge in developing both small molecule and antibody therapeutics for CNS disorders including brain cancer and neurodegenerative diseases, is penetrating the blood brain barrier (BBB). A study published in FASEB demonstrated that monomeric variable heavy-chain domain of camel homodimeric antibodies (mVHH), can cross the BBB in-vivo, and recognize its intracellular target: glial fibrillary acidic protein (GFAP). The ability of mVHH to cross the BBB of normal animals and those undergoing pathological stress makes it a promising modality for treating CNS diseases as well as for brain imaging. The investigators of this study expressed a recombinant fusion protein, VHH-GFP, which was able to cross the BBB in-vivo and specifically label astrocytes. GenScript is fully engaged in single-domain antibody lead generation and optimization. With our one-stop services, we are determined to be your best partner in antibody drug discovery from gene synthesis to in-vivo characterization of candidate antibodies. All you need to provide is the Genbank accession number of the antigen protein! With a wide range of animal models to choose from, what are the crucial factors to consider? A recent perspective published in Nature Medicine addresses these gaps by comparing the strengths and limitations of different tumor models, as well as best models to use for answering different biological questions and best practices for preclinical modeling. Understanding the pharmacokinetics of a drug in the model prior to studies is important to ensure that the dosing is within range, and that off-target and toxic side effects are not skewing anti-tumor activity. Brain research is the most expanding interdisciplinary research that is using the state of the art techniques to overcome limitations in order to conduct more accurate and effective experiments. Drug delivery to the target site in the central nervous system (CNS) is one of the most difficult steps in neuroscience researches and therapies. Taking advantage of the nanoscale structure of neural cells (both neurons and glia); nanodrug delivery (second generation of biotechnological products) has a potential revolutionary impact into the basic understanding, visualization and therapeutic applications of neuroscience. Current review article firstly provides an overview of preparation and characterization, purification and separation, loading and delivering of nanodrugs. Different types of nanoparticle bioproducts and a number of methods for their fabrication and delivery systems including (carbon) nanotubes are explained. In the second part, neuroscience and nervous system drugs are deeply investigated. Different mechanisms in which nanoparticles enhance the uptake and clearance of molecules form cerebrospinal fluid (CSF) are discussed. The focus is on nanodrugs that are being used or have potential to improve neural researches, diagnosis and therapy of neurodegenerative disorders. Keywords: Nanodrug, Nanofabrication and purification, Neuroscience, Nervous system, Nano-nervous drugs. The delivery of drugs to the nervous system is mainly limited by the presence of two anatomical and biochemical dynamic barriers: the blood–brain barrier (BBB) and blood–cerebrospinal fluid barrier (BCSFB) separating the blood from the cerebral parenchyma . These barriers tightly seal the central nervous system (CNS) from the changeable milieu of blood. With the advancement of electron microscopy it is found that the ultrastructural localization of the blood–brain barrier is correlated with the capillary endothelial cells within the brain . The BBB inhibits the free paracellular diffusion of water-soluble molecules by an elaborate network of complex tight junctions (TJs) that interconnects the endothelial cells. Similar to the endothelial barrier, the morphological correlate of the BCSFB is found at the level of unique apical tight junctions between the choroid plexus epithelial cells inhibiting paracellular diffusion of water-soluble molecules across this barrier [1, 3]. Beside its barrier function, it allows the directed transport of ions and nutrients into the cerebrospinal fluid (CSF) and removal of toxic agents out of the CSF using numerous transport systems. One of the most challenging steps in neuroscience researches and therapy is the availability of techniques to penetrate these permeability barriers and delivering drugs to the CNS. Several strategies have been used to circumvent the barriers inhibiting CNS penetration. These strategies generally fall into one or more of the following three categories: manipulating drugs, disrupting the BBB (BBBD) and finding alternative routes for drug delivery. Drug manipulation methods include: Lipophilic Analogs, prodrugs, chemical drug delivery systems (CDDS), Carrier-mediated transport (CMT) and Receptor-mediated drug delivery. The drug manipulating strategy has been frequently employed, but the results have often been disappointing [4–6]. All of these methods have major limitations: they are invasive procedures, have toxic side effects and low efficiency, and are not sufficiently safe . Two methods for disrupting the BBB have been reported: osmotic blood-brain barrier disruption and biochemical blood-brain barrier disruption. However, these procedures also break down the self-defense mechanism of the brain and make it vulnerable to damage or infection from all circulating chemicals or toxins. Since the above techniques aim to enhance the penetration of drugs to the CNS via circulatory system, they will increase the penetration of drugs throughout the entire body. This will frequently result in unwanted systemic side effects. In the other hand, systemically administered agents must penetrate the BBB to enter the CNS, which is a difficult task. Despite advances in rational CNS drug design and BBBD, many potentially efficacious drug molecules still cannot penetrate into the brain parenchyma at therapeutic concentrations. The alternative strategy to enhance CNS penetration of drug molecules is based on methodology that does not rely on the cardiovascular system. These strategies circumvent the BBB altogether and do not need drug manipulation to enhance BBB permeability and/or BBBD. Using alternative routes to deliver drugs to the CNS, e.g. intraventricular/intrathecal route and olfactory pathway, is one of these strategies. One strategy for bypassing the BBB that has been studied extensively both in laboratory and in clinical trials is the intralumbar injection or intreventricular infusion of drugs directly into the CSF. Compared to vascular drug delivery, intra-CSF drug administration theoretically has several advantages. Intra-CSF administration bypasses the BCB and results in immediate high CSF drug concentrations. Due to the fact that the drug is somewhat contained within the CNS, a smaller dose can be used, potentially minimizing systemic toxicity. Furthermore, drugs in the CSF encounter minimize protein binding and decrease enzymatic activity relative to drugs in plasma, leading to longer drug half-life in the CSF. Finally, since the CSF freely exchanges molecules with the extracellular fluid of the brain parenchyma, delivering drugs into the CSF could theoretically result in therapeutic CNS drug concentrations [7, 8]. However, for several reasons this delivery was not as successful as predicted. These include a slow rate of drug distribution within the CSF and increase in intracranial pressure associated with fluid injection or infusion into small ventricular volumes. Another CNS drug delivery route is the intranasal route. In this method drugs are transported intranasally along olfactory sensory neurons to yield significant concentrations in the CSF and olfactory bulb. An obvious advantage of this method is that it is noninvasive relative to other strategies. This method has received relatively little attention, since there are difficulties that have to be overcome. Among these obstacles is an enzymatically active, low pH nasal epithelium, the possibility of mucosal irritation or the possibility of large variability caused by nasal pathology, such as common cold. Based on the advantages and disadvantages of aforementioned strategies, researchers are still looking for novel and better methods of CNS drug deliveries. The most direct way of circumventing the BBB is to deliver drugs directly to the brain interstitium which mainly includes the use of small colloidal particles like liposomes and nanoparticles . By directing agents uniquely to an intracranial target, interstitial drug delivery can theoretically yield high CNS drug concentrations with minimal systemic exposure and toxicity. Furthermore, with this strategy, intracranial drug concentrations can be sustained, which is crucial in treatment with many chemotherapeutic agents. The basic reason of common acceptance of these carriers is due to their controlled profile or drug release nature as well as due to their selected targeting mechanism. Targeting action maybe due to the steric hindrance created by nano-vectors for achieving targeting ability. These carriers are usually administered through parenteral route and due to their steric phenomenon they conceal themselves from opsonisation event induced by tissue macrophages. By this way they achieve targeting ability to brain and other reticuloendothelial system (RES) organs like liver, spleen, etc. Several approaches have been developed for delivering drugs directly to the brain interstitium like injections, catheters, and pumps. One such methodology is the Ommaya reservoir or implantable pump which achieves truly continuous drug delivery. Though interstitial drug delivery to the CNS has had only modest clinical impact, its therapeutic potential may soon be realized using new advances in polymer technologies to modify the aforementioned techniques. Polymeric or lipidbased devices that can deliver drug molecules at defined rates for specific periods of time are now making a tremendous impact in clinical medicine. Among the strategies of direct drug delivery to the CNS, nanoparticles have attracted considerable interest from the last few decades. It has been shown that nano delivery systems have great potential to facilitate the movement of drugs across barriers (e.g., BBB). Nanosystems employed for the development of nano drug delivery systems in the treatment of CNS disorders include polymeric nanoparticles, nanospheres, nanosuspensions, nanoemulsions, nanogels, nano-micelles and nano-liposomes, carbon nanotubes, nanofibers and nanorobots, solid lipid nanoparticles (SLN), nanostructured lipid carriers (NLC) and lipid drug conjugates (LDC). Although the exact mechanism of barrier opening by nanoparticles is not known, the novel properties such as tiny size, tailored surface, better solubility, and multi-functionality of nanoparticles present the capability to interact with composite cellular functions in new ways. In fact, nanotechnology has now emerged as an area of research for invention of newer approaches for the CNS drug delivery and a revolutionary method to improve diagnosis and therapy of neurodegenerative disorders. In this line, an overview of preparation and characterization, purification and separation, loading and delivering of nanodrugs is the first subject of this review. Different types of nanoparticle bioproducts including carbon nanotubes as a drug delivery system and also as a novel tool in neuroscience research are explored. For instance, nanodrug delivery systems like human serum albumin (HSA) nanoparticles, bovine serum albumin (BSA)-Gum Arabic (Acacia) nanoparticles and α-lactalbumin nanoparticles are explained. The impact of nanotechnology on neuroscience and drug delivery to the central nervous system (CNS) is the subject of the second part of this review. Different mechanisms in which nanoparticles enhance the uptake of molecules both hydrophilic and hydrophobic across the BBB and the impact of various physiochemical parameters of nanoparticles on its uptake and clearance form CSF are discussed. Also nanodrugs that are being used or have potential to improve neural researches, diagnosis and therapy of neurodegenerative disorders are investigated. Nanotechnology started by the suggestion of a famous physicist, Richard Feynman, that it should be possible, in principle, to make nanoscale machines that “arrange the atoms the way we want”, and do chemical synthesis by mechanical manipulation [9, 10]. Nanotechnologies exploit materials and devices with a functional organization that has been engineered at the nanometer scale. In a broad sense, they can be defined as the science and engineering involved in the design, syntheses, characterization, and application of materials and devices whose smallest functional organization in at least one dimension is on the nanometer scale, ranging from a few to several hundred nanometers. A nanometer is roughly the size of a molecule itself (e.g., a DNA molecule is about 2.5 nm long while a sodium atom is about 0.2 nm) . Nanotechnology is not in itself a single emerging scientific discipline but rather a meeting of traditional sciences such as chemistry, physics, materials science, and biology to bring together the required collective expertise needed to develop these novel technologies. The application of nanotechnology in cell biology and physiology enables targeted interactions at a fundamental molecular level. Nanotechnology, in the context of nanomedicine, can be defined as the technologies for making nanocarriers of therapeutics and imaging agents, nanoelectronic biosensors, nanodevices, and microdevices with nanostructures. It also covers possible future applications of molecular nanotechnology (MNT) and nanovaccinology. Unlike the definition in core nanotechnology field, which restricts the “nano” to at least 1–100 nm in one dimension, nanocarriers in the biomedical field are often referred to as particles with a dimension a few nanometers to 1000 nm [8, 11]. Although, the initial properties of nanomaterials studied were for its physical, mechanical, electrical, magnetic, chemical and biological applications, recently, attention has been geared towards its pharmaceutical application, especially in the area of drug delivery . There are a few challenges in use of large size materials in drug deliveries. Some of these challenges are poor bioavailability, in vivo stability, solubility, intestinal absorption, sustained and targeted delivery to site of action, therapeutic effectiveness, generalized side effects, and plasma fluctuations of drugs (see Table 11). The most important innovations are taking place in nanopharmocology and drug delivery which involves developing nanoscale particles or molecules to improve bioavailability. These pharmacological applications of nanotechnology include: the formation of novel nanoscopic entities [11, 27], exploring and matching specific compounds to particular patients for maximum effectiveness; and advanced pharmaceutical delivery systems and discovery of new pharmacological molecular entities; selection of pharmaceuticals for specific individuals to maximize effectiveness and minimize side effects, and delivery of pharmaceuticals to targeted locations or tissues within the body. Examples of nanomaterials include nanotubes and nanofibers, liposomes, nanoparticles, polymeric micelles, block ionomer complexes, nanogels, and dendrimers. Nanotubes [28, 29] and nanofibers mimic tubular structures that appear in nature, such as rod shaped bacteria or viruses, microtubules, ion channels, as well as axons and dendrites. They are low-dimensional nanostructures, having a very large axial ratio. Properties of a molecule in a nanotube or nanofiber structure can be different from those in the bulk or in other nanomaterials, such as spherical nanoparticles. These materials have a large surface–volume ratio, which results in a high exposure of the material components to the surrounding environment . This makes nanotubes and nanofibers promising structures for biosensing and molecular recognition . However, it provides a way to control drug release through the nanotubes wall, while the large hollow area inside nanotubes provides an excellent storage for drugs and other agents . Furthermore, nanotubes can be synthesized to be open-ended, which can be exploited for certain biological applications. Carbon nanotubes (CNTs) was discovered by Iijima  which are composed of carbon atoms arranged in hexagonal ring structures similar to graphite, with some five-membered or seven-membered rings providing the structure curvature [29, 34,35]. CNTs are compatible with biological tissues for scaffolding purposes and the charge carried by the nanotubes can be manipulated to control neurite outgrowth [36, 37]. It has also been suggested that CNTs functionalized with growth factors, such as nerve growth factor or brain-derived neurotrophic factor, can stimulate growth of neurons on the nanotube scaffold [38–40]. In such application the toxicity of CNTs remains an issue that must be overcome [41, 42]. It has been reported that conductive polymer coatings for living neural cells has been generated using poly (3,4-ethylenedioxythiophene) PEDOT nanotubes . The electric conductivity of PEDOT was used to enhance the electrical activity of the tissue with a long range aim of treating CNS disorders, which show sensory and motor impairments. These observations suggested that nanotube and nanofiber scaffolds have potential for neuroregeneration as well as treatment of CNS trauma [27, 44]. Nanomaterials suggest a promising strategy for neuroprotection . Neuroprotection is an effect that may result in salvage, recovery, or regeneration of the nervous system. The role of nanotechnology in targeted drug delivery and imaging was discussed in many reviews and papers [46, 47]. As a step towards a realistic system, a brief overview of preparation, characterization, delivery, loading, purification and separation of nanoparticles and nanodrugs are presented herein. In next two sections the fabrication methods of nanoparticle bioproducts and also the delivery systems of nanodrugs are explained. Subsequently we go back to the CNS nanodrugs for research and therapy and the delivery systems of nanodrugs for nervous system. Particle size and surface characteristics of nanoparticles can be easily manipulated to achieve both passive and active drug targeting after parenteral administration. They control and sustain release of the drug during the transportation and at the site of localization, altering organ distribution of the drug and subsequent clearance of the drug so as to achieve increase in drug therapeutic efficacy and reduction in side effects. Controlled release and particle degradation characteristics can be readily modulated by the choice of matrix constituents. Drug loading is relatively high and drugs can be incorporated into the systems without any chemical reaction; this is an important factor for preserving the drug activity. Site-specific targeting can be achieved by attaching targeting ligands to surface of particles or use of magnetic guidance. The system can be used for various routes of administration including oral, nasal, parenteral, intraocular etc. Nanomaterials and nanoparticles can interact with biological systems at fundamental and molecular levels [100, 101]. In neuroscience, the application of nanotechnologies entails specific interactions with neurons and glial cells. Nanodevices can target the cells and glia with a high degree of specificity. This unique molecular specificity enables the nanodrugs to stimulate and interact with tissues and neurons in controlled ways, while minimizing undesirable effects. There are two main types of nervous system drugs (neurodrugs): behavioural and molecular. Behavioural neurodrugs are for the study of how different drugs affect human behaviour and human brain. These drugs are usually used for diagnosis and therapy of neurodegeneration disorders [47, 102]. Molecular neurodrugs are used for the study of neurons and their neurochemical interactions. Since for the most part, neurons in the human brain communicate with one another by releasing chemical messengers called neurotransmitters, these drugs have to target specific transmitters and receptors to have beneficial effect on neurological functions. The preparation of these two types of drugs is closely connected. Researchers are studying the interactions of different neurotransmitters , neurohormones , neuromodulators , enzymes , second messengers , co-transporters [108, 109], ion channels , and receptor proteins  in the central and peripheral nervous systems to develop drugs to treat many different neurological disorders, including pain , neurodegenerative diseases such as Parkinson’s disease  and Alzheimer’s disease , psychological disorders , addiction , and many others. The blood–brain barrier significantly hinders the passage of systemically delivered therapeutics and the brain extracellular matrix limits the distribution and longevity of locally delivered agents. Nanoparticles represent a promising solution to these problems. They can cross blood-brain barrier and enter the CNS. Although the applications of nanotechnology in basic and clinical neuroscience are only in the early stages of development, partly because of the complexities associated with interacting with neural cells and the mammalian nervous system, however the early results show an impressive potential of nanotechnologies to contribute to neuroscience research . One area in which nanotechnology may have a significant clinical impact in neuroscience is the selective transport and delivery of drugs and other small molecules across the blood brain barrier that cannot cross otherwise. Examples of current research include technologies that are designed to better interact with neural cells, advanced molecular imaging technologies [118, 119], materials and hybrid molecules used in neural regeneration , neuroprotection , and targeted delivery of drugs and small molecules across the blood–brain barrier [122, 123]. Among all these modern methods of drug delivery to the central nervous system (CNS), the design and application of bionanotechnologies aimed at the CNS provide revolutionary new approaches for studying cell and molecular biology and physiology. The successful and meaningful development of bionanotechnologies designed to interact with the CNS as research or clinical tools require an understanding of the relevant neurophysiology and neuropathology, an appreciation of the inherent ‘nanoscale’ structure of the CNS, and an understanding of the relevant chemistry and materials science and engineering. At nanoscale, consideration of individual molecules and interacting groups of molecules in relation to the bulk macroscopic properties of the material or device becomes important, since it is control over the fundamental molecular structure that allows control over the macroscopic chemical and physical properties . Applications to neuroscience and physiology imply materials and devices designed to interact with the body at subcellular (i.e., molecular) scales with a high degree of specificity. This can potentially translate into targeted cellular and tissue-specific clinical applications designed to achieve maximal therapeutic affects with minimal side effects. It started with controlled release strategy and the development of miniaturized delivery systems  and continued by the application of albumin nanoparticles for the first time in the Johns Hopkins Medical Institution in Baltimore . Other nanoconstructs such as drug-polymer conjugates were first proposed in the 1970s  and developed pre-clinically in the 1980s . Prof. Kreuter  proposed a definition of polymeric nanoparticles for pharmaceutical purposes for the first time that later was adopted by the Encyclopaedia of Pharmaceutical Technology  and the Encyclopedia of nanotechnology . Today, more than 25 nanomedicines have already been approved for human use . Usually the application of nanodrugs to neuroscience is divided into two parts: application in basic neuroscience , and in clinical neuroscience . The development of nanotechnology products may play an important role in adding a new group of therapeutics to the products of pharmaceutical companies . Nanotechnology enhances (1) delivery of poorly water-soluble drugs; (2) delivery of large macromolecule drugs to intracellular sites of action; (3) targeted delivery of drugs in a cell- or tissue-specific manner; (4) transcytosis of drugs across tight epithelial and endothelial barriers; (5) co-delivery of two or more drugs or therapeutic modality for combination therapy; (6) visualization of sites of drug delivery by combining therapeutic agents with imaging modalities; and (7) real-time read on the in vivo efficacy of a therapeutic agent . Additionally, the manufacturing complexity of nanotechnology therapeutics may also create a significant hurdle for generic drug companies to develop equivalent therapeutics readily . Safe, site-specific, and efficient delivery of compounds to CNS disease sites remains a singular goal in achieving optimal therapeutic outcomes to combat neurodegenerative diseases. Treatment of CNS disorders by systemic administration or local delivery of drugs is currently inefficient in many cases. Furthermore, clinical neuroscience faces great challenges due to the extremely heterogeneous cellular and molecular environment and the complexities of the brain’s anatomical and functional “wiring” and associated information processing . However, the emergence of nanotechnology provides hope that it will revolutionize diagnosis and treatment of CNS disorders. Neurodegenerative diseases are usually linked to a loss of brain and spinal cord cells. For example, the neuronal damage in AD and PD is associated with abnormal protein processing and accumulation and results in gradual cognitive and motor deterioration . Neuroblastoma is the most common extracranial solid tumor of infancy. It is an embryonal tumor of the autonomic/sympathetic nervous system arising from neuroblasts (pluripotent sympathetic cells).In the developing embryo, these cells invaginate, migrate along the neuraxis, and populate the sympathetic ganglia, adrenal medulla, and other sites. The patterns of distribution of these cells correlates with the sites of primary neuroblastoma presentation. Age, stage, and biological features encountered in tumor cells are important prognostic factors and are used for risk stratification and treatment assignment. The differences in outcome for patients with neuroblastoma are striking. The incidence of neuroblastoma per year is 10.5 per million children less than 15 years of age (1). Neuroblastoma accounts for 8% to 10% of all childhood cancers and for approximately 15% of cancer deaths in children. Cases of familial neuroblastoma have been reported (but rare). Asymptomatic tumors could be detected in infants by measurement of urinary catecholamine metabolites (2). Note: The Quebec Neuroblastoma Screening Project and the German Neuroblastoma Screening studies demonstrate that screening for neuroblastoma at or under the age of 1 year identiﬁes tumors with a good prognosis and molecular pathology, doubles the incidence, and fails to detect the poor-prognosis disease that presents clinically at an older age. The peripheral neuroblastic tumors (pNTs), including neuroblastoma, belong to the ‘‘small blue round cell’’ neoplasms of childhood (3). “They are derived from progenitor cells of the sympathetic nervous system: the sympathogonia of the sympathoadrenal lineage. After migrating from the neural crest, these pluripotent sympathogonia form the sympathetic ganglia, the chromaﬃn cells of the adrenal medulla, and the paraganglia, reﬂecting the typical localization of neuroblastic tumors”. Defects in embryonic genes controlling neural crest development are likely to underlie the proliferation and differentiation of neurobalstoma, yet the precise mechanism is unknown.Developmental programs controlling self-renewal in neuronal stem cells, including the Notch, Sonic hedgehog, and Wnt/b-catenin pathways, have been implicated in embryonal tumorigenesis (1,4,5). Zhi F et al investigated the role of Wnt/β-catenin in modulation of cellular plasticity of the N2A cells-derived neurons and its possible functions in origination of neuroblastoma. In human neuroblastoma specimens, the authors found that the amount of activated β-catenin in nucleus was up-regulated significantly in pace with clinical neuroblastoma risk (8). Wickstorm M et al as well as others have investigated the role of Hedgehog (HH) signaling pathway and its role in the development of several types of cancer (9,10). Specific inhibitors revealed that inhibition of HH signaling at the level of GLI was most effective in reducing neuroblastoma growth. GANT61 sensitivity positively correlated to GLI1 and negatively to MYCN expression in the neuroblastoma cell lines tested. Wickstrom M and colleagues suggest that suggests that inhibition of HH signaling is a highly relevant therapeutic target for high-risk neuroblastoma lacking MYCN amplification and should be considered for clinical testing. Although Sonic hedgehog, and Wnt/b-catenin pathways were found to be relevant in neuroblastoma progression, there were yet to be implied in the clinical practice. (3) Ganglioneuroblastoma, nodular (composite Schwannian stroma-rich/stroma dominant and stroma-poor). 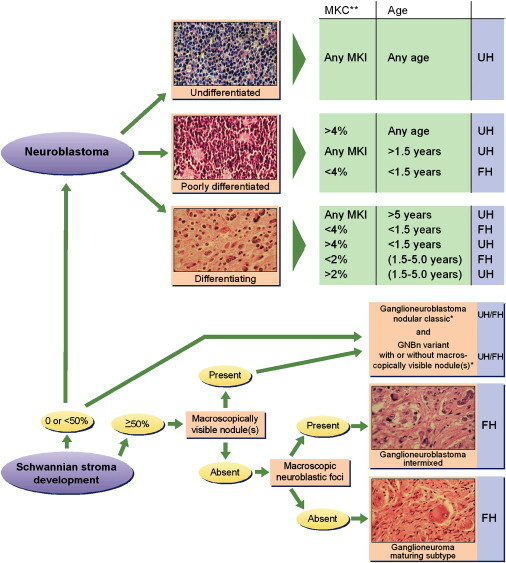 Shimada et al developed a histopathologic classification in patients with neuroblastoma (6) which was adapted by the INPC. Patients with low-risk and intermediate-risk neuroblastoma have excellent prognosis and outcome. Patients with high-risk disease continue to have very poor outcomes despite intensive therapy. Unfortunately, approximately 70-80% of patients older than 18 months present with metastatic disease, usually in the lymph nodes, liver, bone, and bone marrow, with particular predilection for metaphyseal, skull, and orbital bone sites. ” A classic presentation of periorbital swelling and ecchymoses (‘‘raccoon eyes’’) is seen in children who have disease spread to periorbital region”. In contrast to the frequent lack of symptoms with locoregional disease, patients who have widespread disease are often ill appearing with fever, pain, and irritability. Many chromosomal and molecular abnormalities have been identified in patients with neuroblastoma, some of these have been incorporated into the strategies used for risk assignment (7). MYCN amplification – is considered the most important biomarker in patients with neuroblastoma. “MYCN is an oncogene that is overexpressed in approximately one quarter of cases of neuroblastoma via the amplification of the distal arm of chromosome 2. This gene is amplified in approximately 25% of de novo cases and is more common in patients with advanced-stage disease. Patients whose tumors have MYCN amplification tend to have rapid tumor progression and poor prognosis, even in the setting of other favorable factors such as low-stage disease or 4S disease” (7). Deletion of Chromosome 1 – Deletion of the short arm of chromosome 1 is the most common chromosomal abnormality present in neuroblastoma and confers a poor prognosis. The 1p chromosome region likely harbors tumor suppressor genes or genes that control neuroblast differentiation. Deletion of 1p is associated with more advanced stage of the disease. DNA index – a useful test that correlates with response to therapy in infants. DNA index >1 (=hyperdiploidy) have good therapeutic response while DNA index <1 are less responsive and require a more aggressive treatment. Note – DNA index does not have any prognostic significance in older children and this index occurs in the context of other chromosomal and molecular abnormalities that confer a poor prognosis. Neurotrophin receptors (TrkA, TrkB and TrkC) – TrkA gene expression is inversely correlated with the amplification of the MYCN gene. In most patients younger than 1 year, a high expression of TrkA correlates with a good prognosis, especially in patients with stages 1, 2, and 4S. TrkC gene is correlated with TrkA expression. In contrast, TrkB is more commonly expressed in tumors with MYCN amplification. This association may represent an autocrine survival pathway. Disruption of normal apoptotic pathways – Drugs that target DNA methylation, such as decitabine, are being explored in preliminary studies. Others – other gene and protein expression were found such as glycoprotein CD44 and multidrug resistance protein (MRP). Yet their role in the development of neuroblastoma is controversial. The table below outlines criteria for risk assignment based on the International Neuroblastoma Staging System (INSS), age, and biologic risk factors. These criteria are based on the analysis of several thousands of patients treated in cooperative group protocols in Australia, Canada, Europe, Japan, and the United States. Low-risk neuroblastoma Survival rates for patients who have INSS stage 1 disease, regardless of biologic factors, are excellent with surgery alone. Chemotherapy may be needed as an eﬀective salvage therapy for patients who have INSS stage 1 disease who relapse after surgery only. Stage 4S neuroblastoma withoutMYCN ampliﬁcation undergoes spontaneous regression in the majority of cases. Chemotherapy or low-dose radiotherapy is used in patients who have large tumors or massive hepatomegaly. Surgical resection and moderate–dose, multiagent chemotherapy (cyclophosphamide, doxorubicin, carboplatin, etoposide) are the standard of care. Chemo rounds are of either 4 cycles, 6 cycles, or 8 cycles, depending on histology and DNA index and response to treatment. If residual disease is present after chemotherapy and surgery, radiation therapy could be considered. However, the use of radiation is controversial. Patients with high-risk neuroblastoma require treatment with multiagent chemotherapy, surgery, and radiotherapy. Current therapeutic protocols involve 4 phases of therapy, including induction, local control, consolidation and treatment of minimal residual disease. Induction therapy currently involves multiagent chemotherapy with non–cross-resistant profiles, including: alkylating agents, platinum, and anthracyclines and topoisomerase II inhibitors. Topoisomerase I inhibitor are also being considered. Local control involves surgical resection of primary tumor site as well as radiation to primary tumor site. Myeloablative consolidation therapy – myeloablative consolidation therapy with etoposide, carboplatin, and melphalan have improved the outcome of patients. most centers now recommend the use of peripheral blood stem cell support over bone marrow for consolidation therapy in patients with high-risk neuroblastoma. Other consideration – Use of 13-cis -retinoic acid in a maintenance phase of therapy. Recent data have showed improved survival in patients receiving 13-cis -RA in combination with immunomodulatory therapy with interleukin (IL)-2, granulocyte macrophage colony-stimulating factor (GM-CSF), and the chimeric anti-GD2 (gangliosidase) antibody when compared with 13-cis -RA alone. “Neuroblastoma is a heterogenous tumor for which biology dictates clinical behavior”. The main the goal is to have patient-tailored prognosis. Additional research in search for new therapeutics for high-risk patients is needed. Some therapies under investigation include aurora kinase inhibitors, antiangiogenic agents, histone deacetylase inhibitors, and therapeutic metaiodobenzylguanidine (MIBG). According to Park et al: “we must minimize the lasting eﬀects of therapy,For the remaining patients who have low- and intermediate-risk disease,speciﬁcally avoiding organ damage or organ loss from surgery and organ dysfunction or risk for secondary malignancy after chemotherapy”. Other future aspect of therapeutics may include specific inhibitor of this pathway, viz Cyclopamine and other kinase inhibitors like LY294002 for PI3K inhibition or GSK-3β inhibitors in order to inhibit the Hedgehog and the β-catenin pathways, respectively. 3. Triche TJ. Neuroblastoma: biology confronts nosology. Arch Pathol Lab Med 1986;110(11):994–996. no available abstract.